Many people do not realise just how quickly Google's Image search updates. A good test of speed was the iphone. All the mock-ups and leaks on what it could look like turned out to be entirely wrong. 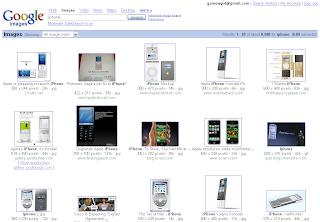 If we can find some accurate images of the iphone on Google Images then we know that Google Images grabbed them since Macworld this week. Not bad, huh? Google's done it. Crawled, indexed and updated in less than a week.